Do Lower Prices Lead to More Sales? Let’s say you’re choosing between three photography courses covering similar topics. What’s going through your mind right now? Curiosity floods your brain. Even if you’re not sure you can afford the $2,000 course, you want to know why it’s so expensive, compared to the other photography courses. If we were truly happy with lower prices, we would simply snap up the $200 workshop, right? We wouldn’t so much as take a glance at the rest. But that’s not how we’re built as human beings. Many years ago, when I consulted with a company that sold beds in a store, we’d take customers around the store. We’d show them beds that cost $1,500, $2,000, and $4,000. And then we’d ask them if they were curious about the bed that cost $4,000. You bet they were. You would be, and so would I — we’d all be curious about the features and benefits that caused an increase of 100 percent (or more) in the price. Lower prices, alone, don’t produce more sales. We’re clear on that idea, aren’t we? And that’s because clients make price decisions either in a vacuum or by comparison. To start, let’s look at making price decisions in a vacuum. Say you decide to buy a bottle of Ardbeg (yup, it’s a really nice, single-malt whisky). But wait — the price of a single bottle of 2009 Ardbeg Supernova is $550. You aren’t asking why at this point in time, because you’re shocked out of your mind. You have nothing to compare it with, so you’re working in a vacuum. The same vacuum concept happens when you buy a product, service, or course, as well. The article-writing course at Psychotactics costs almost $3,000. Is it worth $3,000? You don’t know, do you? You’re working in a vacuum. Sure, you can see testimonials of all the clients who’ve taken the course before. If you read the sales page, the course sounds incredibly detailed. When you pore over the 70-page prospectus, the course seems to satisfy everything you’re looking to learn about article writing. And yet, we sold that course just four years ago for $1,500. So would you have a greater number of clients buying the course at $1,500? Theoretically speaking, yes. But then why not reduce your prices to $750? Or even $350? Or better still, $29? Would you have greater sales of the course then? You see what’s happening here, don’t you? As the price go down, your desire for the course is plummeting just as quickly. And that’s because you’re no longer working in a vacuum. You’re working on comparison. You’re comparing the original price of $3,000 with every other price. And you’d compare the price of the $550 Ardbeg Supernova with every other Ardbeg, until you settled on the lowest price, which would be $60 or so. And at this point in time, if you were still keen, you’d might even end up spending more than $60 on a bottle. You’d probably feel comfortable spending at least $70 or $80, for no reason at all. But there is a reason — and it’s called comparison. When you buy anything, you’re almost always going through two distinct phases. The first phase is when you consider prices in a vacuum. You’ve been told to buy a bottle of really good whisky for a friend, but you have no clue where to start. With all those brands staring at you, you simply pick a nice-looking bottle that is high-priced enough not to be cheap. When searching for a course on article writing, on the other hand, you want to invest in a course that isn’t just an information dump — you want lessons that actually help strengthen your skills. Is $1,500 too high? Or is $3,000 just right? And what if the course is $5,000 or $10,000 instead? But once we get to the higher numbers, we’re no longer working in a vacuum. We’re now comparing the benefits. And while the comparison is often between several brands or companies, price decisions based on comparison can often happen within the very same brand or company. At some point, you compare the $60 Ardbeg with the $550 bottle — and everything in between. Then it dawns on us that the least expensive option we have, a $60 bottle, is still quite expensive — but now it seems cheap. The lower price helps make the sale, but only in comparison. What about pricing on Amazon or iTunes? Let’s say you’re going to sell a book on Amazon or iTunes. Would you want to sell it at a low price? Of course you would, because on Amazon a similar product is also hovering nearby for a low price. When your Kindle book is $35, it’s not cheap at all. You’re asking a potential customer to take a chance on a book that is priced roughly 350 percent higher than most other Kindle books. When you’re on Amazon or iTunes, you’re competing in a completely different playing field. On those sites, they set the rules and comparison structure. On your site, the client is working in a vacuum again. If you were to sell the same product — without changing it at all — exclusively on your own site, there aren’t similar books to compare it with. A $35 book on your own site seems reasonably priced, especially if there are several other products that are both lower and higher (yes, the presence of the lower price matters, too). We see this phenomenon no matter where we go. If you bought a property in Auckland, New Zealand in 2000, the price was about $300,000. If you bought the same house in 2005, that price hovered around $600,000. Today, that very same house sells for over $1.5 million. There’s no increased value in the house, is there? If anything, the fittings and fixtures have depreciated, not appreciated. And yet, when you buy the house, there are factors to compare. A house is more or less expensive based on what’s selling around it at a certain point in time, among other economic factors. An article-writing course that’s $3,000 may seem inexpensive if you know that its price tag is headed up to $5,000. A bottle of $60 Ardbeg seems a bit stingy when you realize it’s at the bottom of the whisky heap. So, how should you price your products? If you sell products on your own site, you can stop reducing your prices, unless you have to for a specific reason. If you’re competing in a marketplace where prices are determined — such as Amazon or iTunes — then you will have to play within their rules. However, if you have several products or versions of the products, then the client can move from comparing your price to comparing prices among your different products. For example, if you buy a Wacom drawing tablet, you can choose from Bamboo, which is less expensive, to Cintiq, which is top-of-the-line and very expensive. Even in a very competitive market, you want to create a situation where clients have stopped considering the competition and are now choosing from your range of products, services, or courses. And if you’re selling something that’s exclusively sold on your site or shop, then there’s still a reason for creating a comparison structure. A client will look around and decide on a purchase based on the various prices you put on your site — even if you’re comparing apples to oranges. For example, if you were to sell a product on “the best ways to use testimonials” and a product on “networking to attract clients,” they aren’t particularly similar. Yet, the price of one product influences the price of the other product. And even if a client buys the lower-priced product, they may move up the price ladder in the future, depending on your ability to deliver the goods. Whether you’re selling a photography course, bed, bottle of whisky, workshop, property, or drawing tablet, the one factor to remember is that clients either buy in a vacuum or in a comparison structure. And you want to get them to compare. Once you’ve gotten them to pay attention to your product or service, you should then have a series of price and product comparisons on your own site or store. So, create that comparison. Even if you don’t have a range of products and prices yet, get started moving in that direction today. And when you do, you can still lower (and raise) your prices. It’s at that point that the lower price becomes a strategy — not a knee-jerk reaction. And it’s at that point that you start setting prices that make you — and your customers — a lot happier. Want to take your content marketing to the next level? 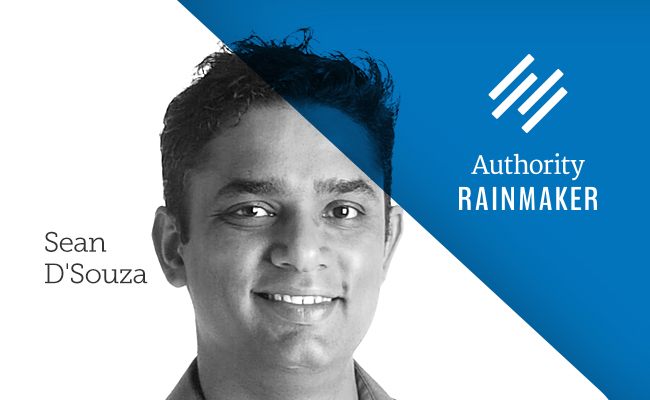 Sean D’Souza is among the powerhouse lineup of speakers who will be presenting at Authority Rainmaker May 13–15, 2015 in Denver, Colorado. It’s integrated content, search, and social media marketing for real-world results. Click here for all the details and to register before we go to full price.